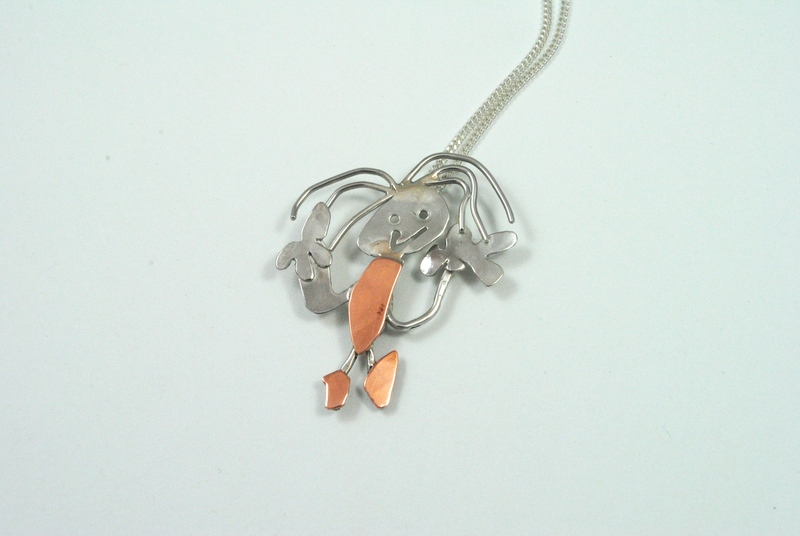 Each SticKid is bespoke made from your child’s drawing out of sterling silver and if appropriate a little copper or brass for added character. Your pendant would be approximately 3cm in height unless otherwise agreed, and will be supplied on a 16” or 18” sterling silver diamond-cut Curb chain and has a silver hand stamped name tag with the artist’s name and age. Prices are quoted per drawing and depend on what’s involved in the design and what materials are needed. Prices start from £65. If you would like me to give you at quote, simply scan and email a picture to me and I’ll be able to give you a quote. SticKidz can also be made as brooches, tie pins & tie clips. I may be able to make a SticKid as a keyring or money clip, but this will depend on the design as many drawings are very delicate once converted to metal and may not be suitable.